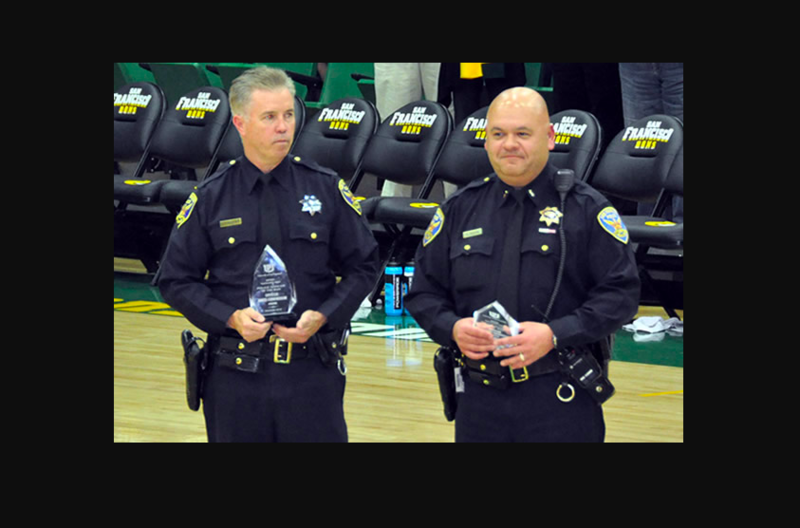 A photo from SFPD’s Taraval Station newsletter shows Officer James Cunningham (left) and then-Lieutenant Gaetano Caltagirone (right) of the Airport Bureau accepting Officer of the Year awards from the University of San Francisco in 2013. Mission Police Station Capt. Bill Griffin will be replaced on Saturday by Capt. Gaetano Caltagirone, formerly the city’s night captain, Mission Local has learned from internal police documents and confirmed with Caltagirone. Griffin was reassigned to an initiative within the Special Operations Unit called the Urban Area Security Initiative, a Bay Area-wide unit tasked with preparing cities for disasters and terrorist attacks. He served as captain of Mission Station for about eight months, starting his tenure with a promise to bring a customer service approach to policing at the station, but cutting back the monthly community meetings to once every two months in favor of meeting with some groups privately on the off months. Calls to Griffin asking for a comment on his Mission tenure have not been returned. In September, Caltagirone, 50, was promoted to captain during a 40-officer promotion spree by Chief Bill Scott. He is a 23-year SFPD veteran and a city native who still resides in San Francisco. His wife, a nurse at San Francisco General Hospital, is also a city native, as are their four children (two girls, two boys). Caltagirone oversaw the Market Street footbeats as a sergeant in Tenderloin station, and earlier walked a beat as a patrolman at Central Station. As part of an initiative to increase community engagement, Chief Scott announced plans in late August to greatly expand foot patrols, and Caltagirone seems enthusiastic to carry this out. He said he wasn’t arriving at Mission Station with preconceived notions of the neighborhood’s problems and solutions for them. The change is part of a personnel rearrangement of some 20 captains. Other transfers include Mission Station’s Robert Yick, who is headed to Taraval Station, and Bayview Station Captain Raj Vaswani, who’s headed to the MTA division. Captain Joseph McFadden is leaving Ingleside Station for the Gun Crimes unit. McFadden will be replaced at Ingleside by Jack Hart and Viswani will be succeeded at Bayview by Steven Ford. The new captain in the Tenderloin is Carl Fabbri. Good luck to the new Captain. Not a good look. 8 months not much time to make any changes. Did he know he was on a short timeframe? At one of his meetings he bemoaned that his best officers were rotating “up and out” of the mission. Need a persistent presence to make a difference.